Alok Vaid-Menon and Janani Balasubramanian have come a long way since meeting at Stanford a few years back. 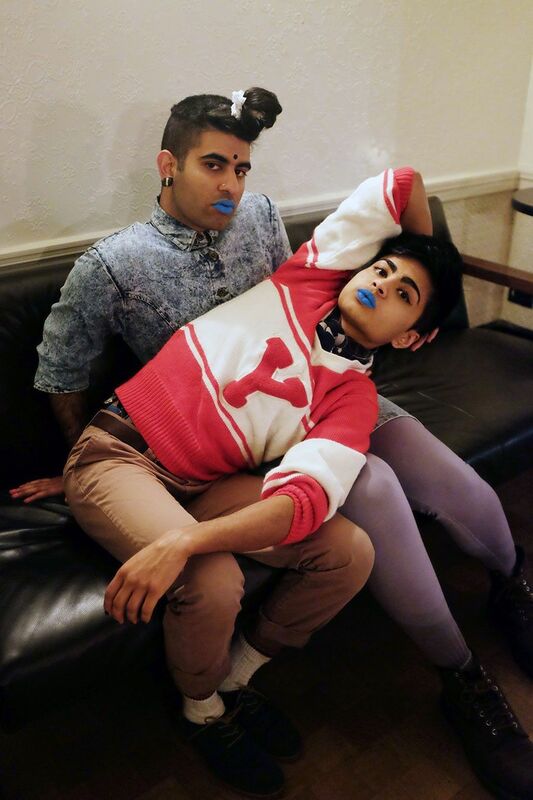 These young queer South Asian performance artists, poets and activists, who together are known as DarkMatter, challenge themselves and their audiences to imagine a vibrant world that includes, without erasing or flattening, complicated marginalized perspectives and creative political possibilities. The Brooklyn-based duo has published articles in which they think through queer Palestinian solidarity, the subtleties of varying white supremacies and the specificities that the designation "people of color" includes, pushing beyond existing activist frameworks. But their work isn't dry in the least – it's often as sharply funny and emotionally affecting as it is a complex digestion of contemporary radical considerations. For instance, "White Fetish," a send-up of white progressives who masquerade their racial fetishes as "good politics," pokes concisely at racially sexualized stereotyping with the line "White people have really big… empires." Both members identify their genders as non-binary trans, meaning they don't fall neatly into one side of the male-female binary or the other – rather, they find themselves somewhere between (non-binary and genderqueer personhoods can look like a lot of different things, as the space between genders is wide). This is reflected in their stylistic presentations, which are sometimes thoughtfully subdued and sometimes colorful and creative, as well as their written ethos. We spoke with them via e-mail (in the below responses, both Alok and Janani respond collectively) about the challenges of having a larger audience, fashion as a component of activism and making space for weirdness. PAPER: Since you formed DarkMatter in 2013, you've attracted a pretty large audience through your performances as well as your social media presence. How do you both find yourselves handling the many pressures that can come with a large and sometimes mainstream audience, if you feel that they're an issue for you? conversation. If anything, it's a combination of being at once deeply uncomfortable, grateful and excited about having a larger platform to share work with. We try to keep laughing and creating through it all. PAPER: You both have such highly realized and personal senses of style; how do you feel that fashion fits into an activist performance project? What do your personal senses of style say to the world about who you are and what your projects are? DarkMatter: Fashion is a huge part of both our aesthetic and political projects. Alok's personal style is something like kindergarten teacher alien evil grandma socialite. Janani's is roughly kindergarten surrealist villainess. For us, fashion is a way of breaking binaries — not just of man/woman, but also beauty/ugly and real/unreal IRL/URL — and opt instead for imagination. Fashion helps us imagine the type of world we're creating: one in which we actually celebrate difference and commit to understanding ourselves outside of the norms we have been filtered through. PAPER: Do you think the current world of queer/genderqueer fashion is an inclusive space, or do you find it limited? If you find it limited, how so? DarkMatter: There's certainly people out there, some of whom are professional fashion designers, making incredible queer fashion. But most of this new turn towards "androgyny" and "genderqueerness" in high fashion is sadly just the same old turn to white thin masculine bodies, and their fifty-shades-of-greyscale color palette. Also, there is nothingreally *new* about genderqueer fashion, as colonialism wiped out thousands of years of fashion and presentation outside of the gender binary. PAPER: What are some of the current activist projects you're involved in? What writing projects are you working on in the new year? DarkMatter: Tough one to summarize since both of these buckets are so expansive, so we'll just give a couple short answers! Alok's still working at the Audre Lorde Project, a community organizing center for and by LGBTQ people of color in New York City. Janani's working on the first novel of a speculative fiction trilogy and a few surrealist short films. PAPER: Something Janani said in your Bluestockings interview really, really resonated with me: "... but I think to a degree challenging systems of power also involves coming to the revolution with all our strangeness and loneliness." This isn't an idea I see recognized often enough in the arts, that there needs to be space made to recognize weirdness. Alok, in the same interview you self-identified as a "weirdo." Can you expand a little bit on this idea of centering weirdness and the way it ends up working itself out in your own work? DarkMatter: Sometimes we say we're the "W" (weird) that got left out of "LGBT." It's tragic, actually, that even the arts world becomes an (unironic) haven of normcore. But transforming this heavy, heavy world into beauty, ugly, meaning, joy and comedy demands a commitment to strangeness. Making space for the strange and terrified parts of ourselves that are so often discarded from public space is exactly the goal of so much of our work.